Samsung Galaxy S9/S9+ is the latest flagship released by Samsung Electronics. As a new generation of Android smartphone leader, it features an edge-to-edge display, AR emoji, a powerful camera and stylish super-slow-motion video. Being attracted by its charm, many iPhone users switch from iPhone to Samsung S9/S9+ without consideration. However, there is one thing bothered them, that is how to transfer all important files such as contacts, text messages etc. from their old phone to the new phone quickly. In response to this issue, this article will give specific solutions below. Gihosoft Phone to Phone Transfer software would be an ideal tool for you to transfer text messages from iPhone to Samsung Galaxy S9/S9+. By using the phone data transfer software, you can migrate all the text messages from iPhone to any Samsung mobile models with detailed information such as text content, time, date and call number etc. Additionally, you can also transfer contacts from iPhone to Samsung Galaxy S9/S9+, as well as calendar, photos, music, videos and other files in one click. 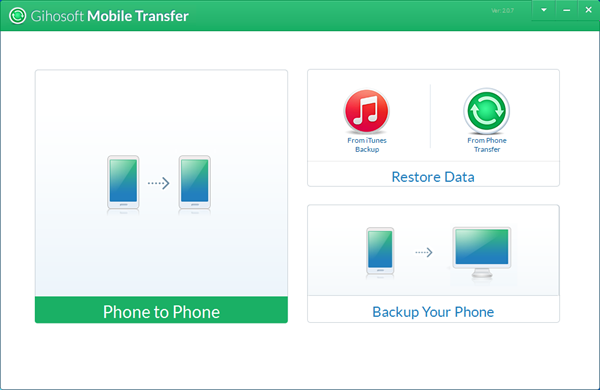 Download the right version of Gihosoft Mobile Phone Transfer to your Windows or Mac computer, then install and launch it. Afterwards, tap the “Phone to Phone”section to continue. Now please tick “SMS” or other files you need to transfer from iPhone to Samsung Galaxy S9/S9+, then hit the ““Start Copy” button to transfer all files at one time. Note: During the process, a dialog will appear on the Samsung S9 or S9+ mobile screen asking you to click “Yes” to set Gihosoft Mobile Transfer as the temporary SMS app so that it can transfer text messages from iPhone to the Samsung S9/S9+. Once you have been informed with “Transfer Completed”, it means that all the iPhone SMS messages has been transferred to the Samsung S9/S9+ completely. 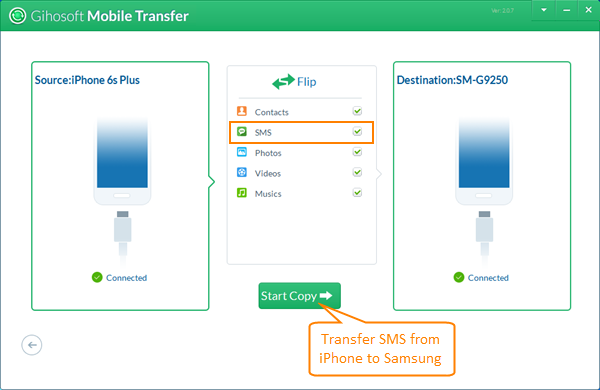 As a professional phone to phone data transfer software, Gihosoft Mobile Transfer can not only enable you to copy messages from iPhone to Samsung, but also transfer messages from iPhone to iPhone, iPhone to Android, Android to iPhone and other combinations of supported devices. Meanwhile, it works perfectly with almost all kings of Android and iOS devices, such as Samsung, Huawei, LG, One Plus, Motorola, HTC, ZTE, Sony, iPhone, iPad, iPod Touch etc. With this powerful data transfer software, you are no longer afraid of data loss after switching phones.